6 Fabulous Tips For Brides With Fine Hair. I am so excited to have recently teamed up with the Australian boutique La Belle to create this blog series the studio is based in Sydney, Australia and creates the dreamiest of heirloom accessories for brides. My blog series for La Belle explores how brides can achieve gorgeous hair on their wedding day no matter the cut, colour or condition. From one fine haired lady to another I understand the frustration and limitations that can come with owning a finer head of hair, today I am sharing my go to tips and advice on how to get those fine haired strands to work just the way you want them to on your special day! #1 Nourish the hair: Fine hair can often grow at a snails pace and be extremely fragile and prone to breakage or damage, to ensure your hair is at its healthiest consider adding a hair growth and strengthening supplement to your regime. There are many varieties available and I recommend trying some of them in the leadup to your wedding day! Biotin, silica and zinc are all great supplemtments to assist with the healthy growth and development of hair & nails. Find the one that is best suited to your needs and budget keep in mind these supplements can take 6-8 months until you see any results so start early. #2 Plump up the volume: Select a professional range of shampoo & conditioner that has volumizing or thicking benefits, they are often less likely to weigh the hair down or make it oily making the hair look thicker and fuller. #3 Shampoo less: I know this can seem like an impossible cycle to break although its worth persevering through a few bad hair days to achieve a balanced & healthy scalp. Shampooing the hair more often then required strips the hair of its natural oils causing your scalp to overproduce the oils that have been stripped from over washing. To achieve a balanced scalp limit shampooing & conditioning to three to four times a week. Only apply your conditioner on the ends of your hair. #4 Protect your hair: Heat damage from hot tools is often underestimated and once the hair has been exposed to heat damage your only option is to cut it off! If you are using heat styling tools such as blow-driers, curling irons or flat irons ensure you are using a thermal protection spray to prevent heat damage in the lead up to your wedding day. #5 Volumize with colour: Hair colour can create an illusion of thicker/denser hair when placed strategically. I recommend a multi-dimensional look with 2-3 shades of variation to make your hair look thicker. Always add a professional treatment after your colour service such as Olapex and avoid over lightening the hair which can lead to breakage and damage. 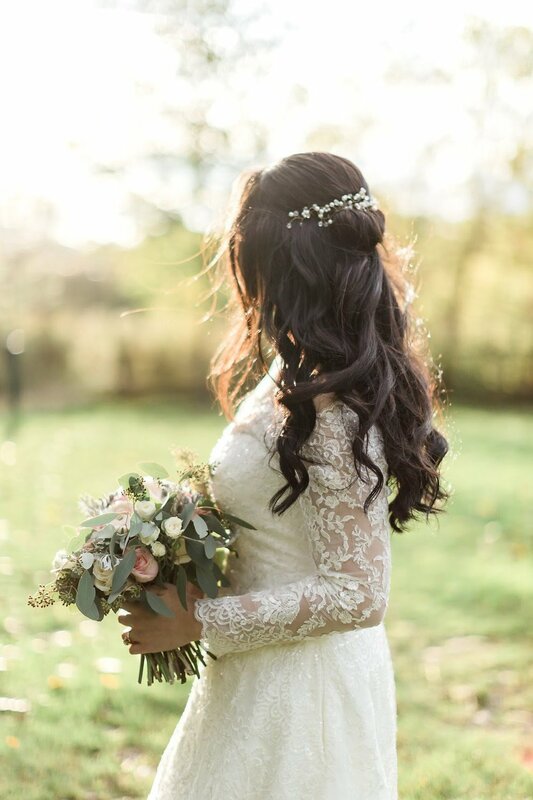 #5 Add Volume: Adding hair extensions to your wedding day hairstyle can be the perfect instant fix to longer thicker hair that will have the benefit of longer lasting hairstyling results on your wedding day. Hair padding (synthetic hair) is also a great alternative to hair extensions to achieve additional volume, and shape to bridal updo's. Stay tuned for more insider tips for brides with thick and curly hair in the following weeks.